SADC inspection team in Botswana. The Botswana Defence Force (BDF) hosted an inspection from a Southern African Development Community (SADC) specialist team to check on readiness for African Standby Force (ASF) roster duties for peace support operations (PSOs). This saw a SADC Secretariat team perform a pre-deployment verification of BDF pledged capabilities for PSOs earlier this month (February). The regional bloc said in a statement the SADC Standby Force (SSF) assumed AU ASF roster duties at the start of the year for a six month rotation with other continental regional economic communities. The ASF roster was put in place in January 2014 following a decision by the ninth Specialised Technical Committee on Defence, Safety and Security (STCDSS) of the continental body. Assumption of the ASF standby roster gives the SADC Standby Force primary responsibility as first responder to conflict situations on the continent via a rapid deployment capability. “In this regard the SADC Standby Force will for the period, be the AU torchbearer for implementing peacekeeping and peace-building efforts, including post-conflict disarmament and demobilisation,” according to an SADC statement. 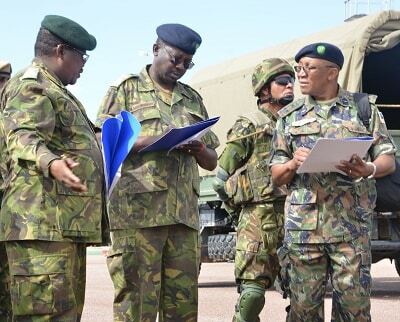 The SADC team led by Chief of Staff, Brigadier Michael Mukokomani, was received by BDF Ground Forces Commander, Major General Molefhi Seikano who informed on other activities the BDF was undertaking as part of force preparedness. This includes pre-deployment training.